Horace Langford Jr./Pahrump Valley Times Nye County Commissioner Leo Blundo is pictured filling potholes on E. Charleston Park Avenue on April 9 using the county's recently purchased DuraPatcher. 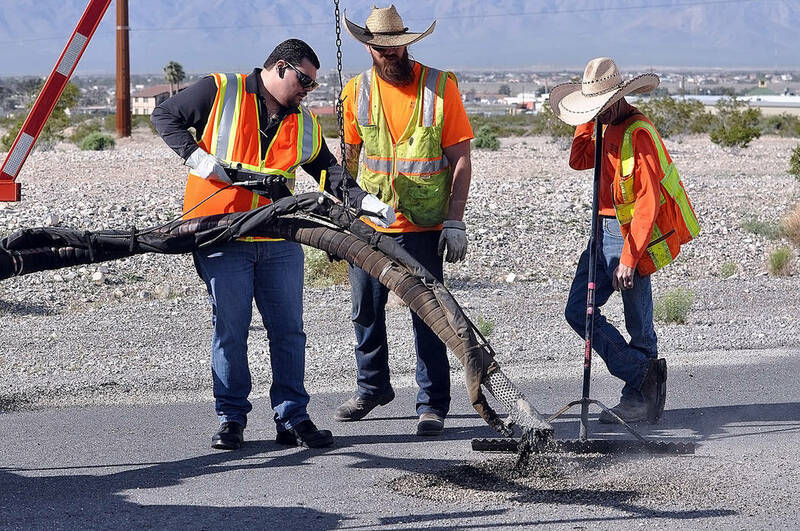 Robin Hebrock/Pahrump Valley Times Large swathes of E. Charleston Park Avenue were in need of extensive pothole patching, which was recently completed by Nye County Public Works with the use of the county's DuraPatcher. On Tuesday, April 9, the machine was put to work in the valley for the first time with road crews heading out to pre-determined locations for the first round of pothole patching using the DuraPatcher machine. Nye County Public Works Director Tim Dahl provided details on the DuraPatcher and its benefits versus the cold mix pothole patching method. “Cold mix is typically used to fill potholes and repair the edge of pavement where normal deterioration of the asphalt occurs. 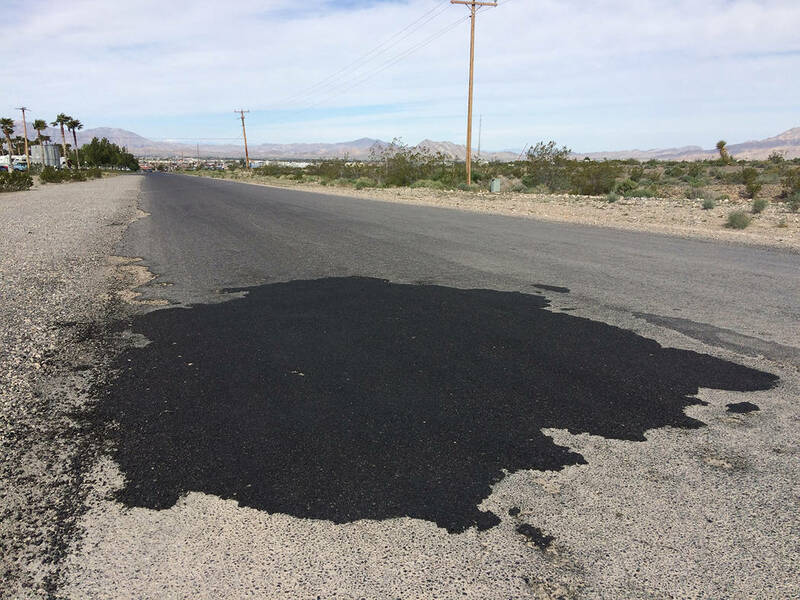 Our new DuraPatcher is going to be much more efficient in repairing these obstacles in our roadways,” Dahl told the Pahrump Valley Times. In a video posted to the Nye County Government Channel on YouTube, Dahl explained that the machine was a recent purchase authorized by the Regional Transportation Commission. The DuraPatcher came at a cost of $75,000 and is anticipated to better help alleviate the constant problem of potholes and crumbling roadway edges. “We are extremely excited about utilizing its potential to repair our roads much faster than the current technique of using cold patch,” Dahl stated. Nye County Commissioner Leo Blundo was obviously thrilled to see the new equipment being put to good use and he even got in on the action by helping to operate the machine himself. “The first reason why this is exciting is, the patching of the potholes using the DuraPatcher will last much longer, we can get two or three years out of the patching. We can get some long-term fixes in,” Blundo explained. “The DuraPatcher is the best thing between cold mix and doing fresh asphalt. Blundo emphasized that the machine is not only useful for potholes but can be used to address the sides of roads where the pavement meets the shoulder, areas that are often prone to deterioration. Blundo noted that he is looking to potentially bring an item before the Nye County Commission in the future to purchase a second DuraPatcher and associated accoutrements. “I think what would be best is to send this unit back up north, because it has a snow plow and also takes care of different functions up north, and then have another DuraPatcher down here in the south,” Blundo said.